Each frame is .1 seconds apart. Kosuke Kitajima's time for this 100-m breaststroke event was 1:00.08. Frame #1: The swimmer starts every stroke from a perfect streamlined position. This is a hallmark of his technique. Frame #2: The hands open at full stretch, but with notably fast speed. The remainder of the swimmer continues in full streamline. Frame #3: The hands change position. They do not open wide. When the hands are at shoulder width two things happen. First, the elbows begin to bend while there is some medial rotation of the upper arms. Second, the wrists flex to position the hands to face mainly backward. Streamline continues. The head and shoulders begin to rise preparatory to breathing. This might appear to be very early. However, because of the brief time it takes this swimmer to complete the arm movement phase of the stroke, the slower raising and lowering of the head and shoulders has to begin early. Frame #4: The hands and forearms create backward propulsive forces. Added medial rotation of the upper arms places the forearms and hands at an angle that is more vertical than not. The position displayed here is similar to one achieved in a good butterfly stroke pull. The body and legs remain streamlined allowing the propelling force to pull the swimmer in a minimally resistive position. Frame #5: After a short backward arm propulsion powered by abduction, the swimmer abruptly halts propulsion and slices the hands inward. Inhalation occurs. The legs still trail in a streamlined position while the torso has inclined, demonstrating the necessity for very good hyperextension flexibility in the lower back. Frame #6: Breathing continues as the hands "pray" in front of the swimmer. The legs and hips continue to trail in a streamlined position. Frame #7: The hands are thrust forward and up. The legs begin to be drawn up preparatory to kicking. Frame #8: The hands have recovered along or slightly over the water surface. The head, shoulders, and torso are thrust forward and downward with great vigor in concert with the final stretch of the arms. The legs continue to be drawn up. Frame #9: A very fast and vigorous arm thrust forward accompanied by the upper body and head gets the swimmer into a streamlined position that corresponds with the most effective part of the kick. In this frame, the swimmer positions the feet wide, fully everted, and with a high degree of knee flexion. Frame #10: The unproductive parts of the swimmer, the arms and upper body, are streamlined as the kick occurs. The feet are wide and turned fully outward. The power of the kick will be derived from the legs as well as the reaction force to the forward thrust of the arms and upper body. This is the second time in this swimmer's stroke where force has been generated with the unproductive parts of the body being fully streamlined. Frame #11: The kick is completed with the feet wide. The width of the feet is a result of kicking directly backward rather than "sweeping" the feet during the kick. The swimmer is streamlined. Frame #12: The feet come together while the frontal streamline is maintained. Frame #13: A position similar to that displayed in Frame #1 is attained. The stroke cycle begins again. 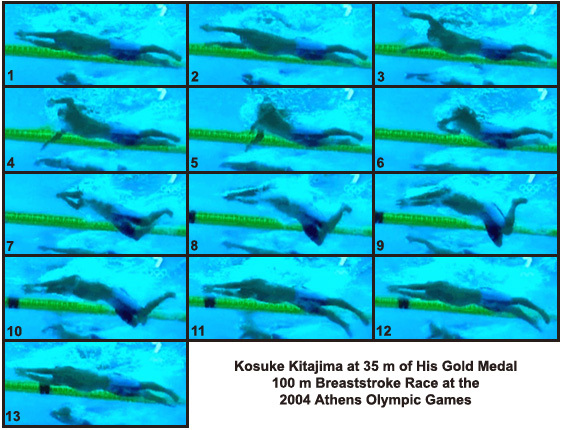 Kosuke Kitajima has two outstanding features in his stroke. When force is produced by the legs or the arms, the unproductive remainder of the body is full streamlined. Considerable localized flexibility is needed to achieve streamline. The second feature is the "discipline" of completing the stroke to maximal streamline before initiating the next stroke cycle. That allows the swimmer to rest briefly while forward momentum is at a maximum. This latter feature results in some energy conservation as well as producing a very effective stroke length. Another notable feature of this swimmer is the speed of the arm stroke cycle. It is very rapid and spends as little time as possible in unproductive positions. The whole cycle takes less than .8 of a second. It also demonstrates a very direct propulsive phase with remarkable speed in the remaining phases.